Let your clients book online. Save hours of administrative work and provide your clients convenient booking system. Manage your classes, bookings, clients and staff. Ir will take very few moments for your clients to make, change or cancel reservation. 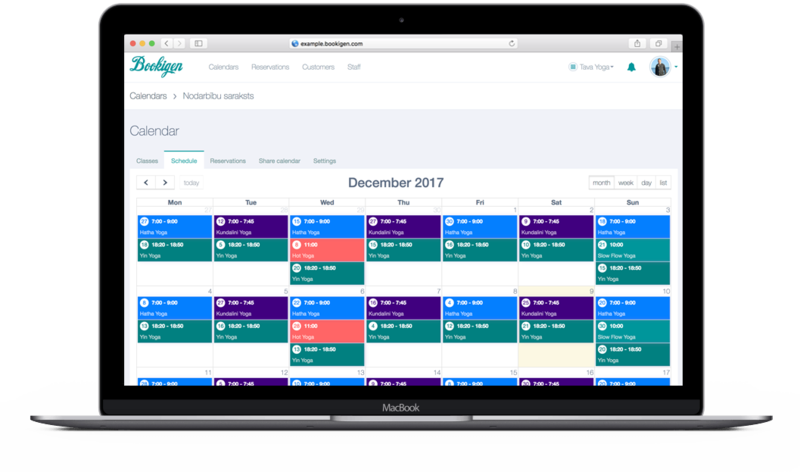 Manage your classes, bookings, clients and staff. Create and manage class packages for your clients will help you to boost client loyalty and mitigate financial impact caused by class booking and missing without cancellation. Automatic individual schedules for your staff, with classes and planned attendance! Use our analytics page to get insights about your services, clients and reservations. Works on desktop computers, tablets and smartphones. Your clients can make bookings without leaving your website or facebook profile. Calculate revenue, classes and hours for each staff member. and try it for free.